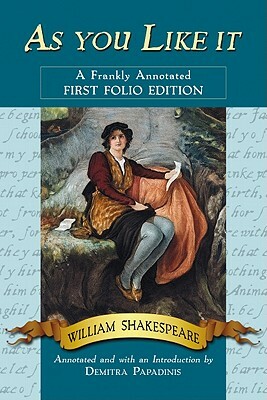 As You Like It: A Frankly Annotated First Folio Edition (Paperback) | The Drama Book Shop, Inc. This annotated version of As you Like it, one of the Bard's wittiest and bawdiest plays, provides a detailed guide to its Elizabethan language and its references. It restores the drama to the language of the First Folio of 1623, including the original spelling, capitalization and punctuation. Practical annotation provides insights into the puns, allusions and world-play that characterize all of Shakespeare's dramas. Appendices enumerate the typographical errors that have been corrected in this version, in addition to offering stage directions from the First Folio, lineation amendations and original character tags. This restorative, no-nonsense approach will appeal to both aficionados and newcomers to Shakespeare's plays. Demitra Papadinis divides her time between New Hampshire and New York City. She is the founder and Producing Artistic Director of the New England Shakespeare Festival and a founding member of New York City's WildBard! An expert in Unrehearsed Shakespeare/First Folio Cue-Script Technique, she presents workshops and educational programs at schools, colleges, and theatres throughout the country.